Children panic under pressure of exams. Parents can help children get over with exam blues. Help set a plan for the exams. 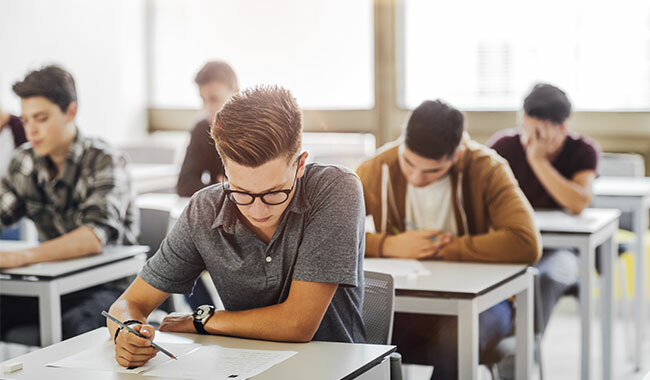 Exams are meant to test learning and ability to implement that learning, but often exams end up being more than just that. They end up being more than something your child can handle. Almost every child experiences exam blues which can very likely prevent the child from performing better at the exams. However, you can easily help your child get rid of the pressure and anxiety of exam blues. Here is how you can help your child beat exam blues and do better in the exams. Exam blues often make children look for ways to avoid the thought and forget about the exams altogether. But they have to take the exam no matter what. Help our kids realise that they have to sit in the exams and there is only limited time for preparation, but more importantly help them understand that there is no need to take pressure. Even if your child finds the time insufficient for preparations, you need to help him focus only on doing better. Help him utilise most the time for preparations but without anxiety and pressure. If you and your child set a goal for the results, make sure you don’t make it sound more like the only option your child has to prove himself. For instance, if you think your child should score 90% in the exams, you should also talk about 85% being a good score. Telling your kid that anything less than 90% will be disappointing will only put pressure on him and prevent him from performing to his full calibre. Also set goals you think your child can achieve. If you think your child can only get around 75% but he/she is determined to get 90%, clearly let them know that although 90% would be really great, but anything between 75% to 90% will be a good score. Every child is unique and so are his abilities to learn and perform. If your child is in some sort of competition with his/her friends, you should help him/her focus only delivering his/her best. No matter how many hours some other child is studying, he may not be as smart as your kid is at that subject. Prepare a planned way ahead of exams on how to learn and revise everything. Help your kid break months or weeks for every subject accordingly. If your child already knows everything in Physics and struggles in Chemistry, suggest your child to spend ample time on Chemistry rather than spending most of the time in revising Physics. Help your child release all the pressure and get instant relief from exam blues by going out or playing their favourite sport. Also offer a balanced healthy diet to your kid which they may like. These small breaks can play a crucial role in your child’s final performance in the exams.